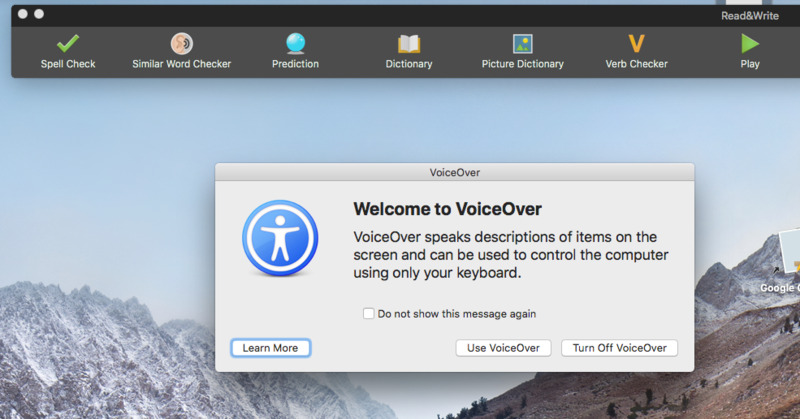 To activate VoiceOver, press CTRL-Command-F5 and tick the option to Enable VoiceOver. Turn on VoiceOver by pressing Command-F5, and then hold down the Control and Option keys (the VO key) and press F8. Press Command-Tab to get focus to Read&Write. Then use the mouse to move over the buttons on the toolbar and click on the feature you want to use. Keyboard access will be available in Read&Write soon.